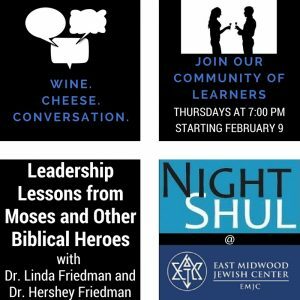 NightShul, EMJC’s innovative adult learning program will kick off 2017 on Thursday, February 9 with a series of three lectures on Leadership Lessons from Moses and Other Biblical Heroes taught by Dr. Linda Friedman and Dr. Hershey Friedman. Unlike many historical documents, the Bible does not cover up mistakes or wrongdoing. This makes it extremely valuable for teaching moral character and leadership. As we know from our own lives, lessons learned from mistakes often provide a more lasting and powerful impact than those learned from doing things right. Also, it is difficult to learn a lesson from the lives of perfect people. The Bible demonstrates that even great people make mistakes. We will examine the mistakes made by some of our greatest leaders, among them Jacob, Judah, Joseph, Moses, Saul, David, Solomon, Mordecai, and Esther to see what we can learn from them. Class begins at 8:00 pm. The fee of $35 for the series (February 9, 16, 23) includes complimentary wine and cheese at 7:00 pm. Email nightshul@emjc.org or call the office at 718.338.3800 to reserve your space.